Westbrook Village in Peoria is an established active adult community in Central Arizona. It offers an ideal blend of large community amenities, attractive homes and a convenient location. Residents of the 3,910-home Westbrook Village favor the community for its proximity to the 101 Loop which provides convenient access to many Phoenix Valley attractions. Westbrook Village is built on the northern edge of the original Sun City. Many retirees who like the location of Sun City, but prefer more newly constructed homes, gravitate towards Westbrook Village. The community was constructed between 1982 and 1993. Compared to Sun City, many of the homes in Westbrook Village feature more modern floor plans and desirable finishes. At just under 4,000 homes, Westbrook Village is considerably smaller than the larger Sun City communities of the Phoenix northwest valley. Yet, a bountiful lineup of amenities provides residents a large community feel with a small-town atmosphere. The tight-knit residents of Westbrook Village find it easy to get acquainted with neighbors and meet new friends. There is an enviable lineup of amenities located throughout Westbrook Village. The first clubhouse built in the community is the Lakes Recreation Center. Here you will find a ballroom, aerobics studio, hobby studios, computers, billiards, and the Sunset Bistro at the Lakes restaurant. Outside, residents have access to tennis courts, horseshoe pits, and an outdoor pool and patio. The second clubhouse available to residents is the Vistas Recreation Center. This large facility features a ballroom, exercise room, hobby studios, multi-purpose rooms, and The Links Neighborhood Grill. 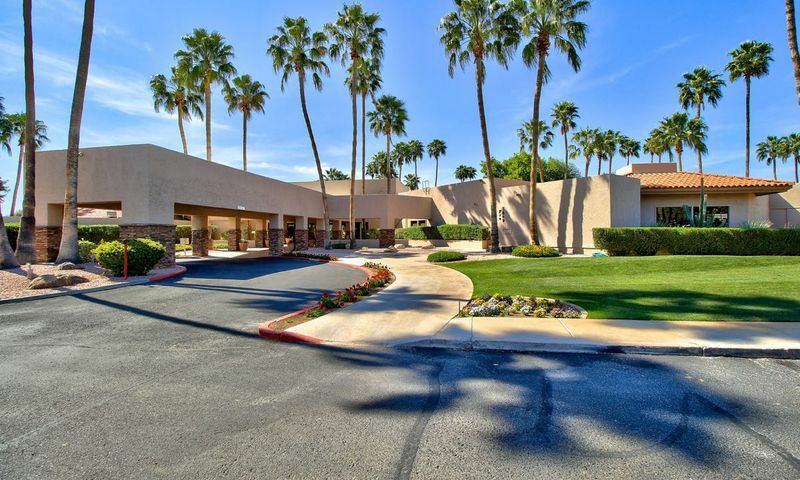 Outside you will find a pool and patio, tennis courts, bocce ball courts, and pickleball courts. In addition to these two amenity-filled centers, Westbrook Village also houses a Fine Arts & Learning Center. Located next to the Vistas Recreation Center, here you will find meeting and game rooms, an art studio, photography studio, and book and video library. Westbrook Golf Club is comprised of two 18-hole championship courses available to both members and the general public. The Lakes Course is a traditional par-71 golf course with mature landscaping and trees accented with numerous water hazards and strategically placed bunkers. The Vistas Course is a challenging 6,400-yard par-72 links style desert course. UDC began construction of Westbrook Village in 1982 and by 1993 it was completed with 3,910 homes within 44 different neighborhoods. There are a variety of home styles and price ranges available in Westbrook Village to meet the tastes and budgets of nearly any active adult homebuyer. There are just a few condos within Westbrook Village. These offer the ultimate in low-maintenance living with just under 1,000 to 1,800 square feet of living space. These units mostly offer two bedrooms, two or two-and-a-half bathrooms, and a balcony or patio. There are many attached homes found throughout the many neighborhoods within Westbrook Village. These single-level attached homes offer approximately 1,363 to 1,478 square feet of living space. Most of these low-maintenance attached homes feature two bedrooms, two bathrooms, and an attached two-car garage. There are a large variety of single-family homes found throughout Westbrook Village. These homes offer a more private option for homebuyers yet they're still low-maintenance and offer main-level living. Most homes range from approximately 1,354 to 2,578 square feet. Many single-family homes feature two to three bedrooms, two or two-and-a-half bathrooms, and an attached two or three-car garage. There are many clubs, activities and events at Westbrook Village that make the community ideal for active adults who want to stay both physically and socially active. Numerous community clubs and interest groups provide a great outlet for like-minded residents to gather with other homeowners who share similar passions. There are over 40 clubs and activities that focus on a range of topics including arts, crafts, books, card games, dance and entertainment, social activities, sports, and fitness. A community calendar is continually updated to inform residents of the latest fun activities, educational classes and exciting trips. Westbrook Village in Peoria, Arizona, is conveniently located near many shopping outlets and cultural attractions. Convenient access to the 101 Loop means residents can be in downtown Phoenix in 30 minutes. Within five miles, residents can enjoy the Arrowhead Mall, Challenger Space Center and West Valley Art Museum. Plus, sports enthusiasts will enjoy the proximity to sporting venues hosting local teams such as the Cardinals (NFL), Coyotes (NHL) and several Major League Baseball spring training camps. With resort-style amenities, a vibrant social scene, and beautiful location in Central Arizona, it's easy to see why Westbrook Village is a popular resale community for today's active adult homebuyers. Westbrook Village is an amenity-filled community. Residents have access to two clubhouses, two golf courses, and many outdoor amenities spread throughout the community. Located at 18827 N. Country Club Parkway, the Fine Arts & Learning Center is located next to the Vistas Recreation Center. There are plenty of activities available in Westbrook Village. Here is a sample of some of the clubs, activities and classes offered here. There are a handful of condos found within the neighborhood of Village Square Resort at Westbrook Village. These offer the ultimate in low-maintenance living. These units range in size from just under 1,000 to about 1,800 square feet. Most homes have two bedrooms, two or two-and-a-half-bathrooms, and a balcony or patio. The condos have their own pool and are located near the Vistas Recreation Center. Please note: Due to the age of this community, condo floor plans are not available at this time. There are many attached homes found throughout the many neighborhoods within Westbrook Village. These single-level attached homes offer approximately 1,363 to 1,478 square feet of living space. Most of these low-maintenance attached homes feature two bedrooms, two bathrooms, and an attached two-car garage. Please note: Due to the age of this community, some attached home floor plans may be missing. There are a large variety of single-family homes found throughout Westbrook Village. These homes offer a more private option for homebuyers yet they're still low-maintenance and offer main-level living. Most homes range from approximately 1,354 to 2,578 square feet. Many single-family homes feature two to three bedrooms, two or two-and-a-half bathrooms, and an attached two or three-car garage. Please note: Due to the age of this community, some single-family floor plans may be missing. Have owned a home here for 14 years. Golf courses are kept in excellent condition with downside being there are no beverage carts. Facilities are always clean as are neighborhoods. Facilities while clean are older and some new remodeling being done at both the Vistas and Lakes facilities. Homes when built best described as excellent construction.The best thing about Westbrook is location, location, location - the best by far of the 55+ communities. Have visited them all and while some are newer - Westbrook offers the best combination of value, size and location. There are so many people around doing all sorts of activities. If you are looking to stay busy in retirement, this is the place it seems like. Everyone is friendly and the location is incredible. I've been really happy with my decision to purchase a home here. My wife and I just moved in last fall and so far everyone has been very friendly. I joined a group of guys for weekly golf and my wife has participated in some of the craft clubs. We're still finding our way and trying everything out but we really like the casual feel of this community and the friendly people. 55places.com is not affiliated with the developer(s) or homeowners association of Westbrook Village. The information you submit is distributed to a 55places.com Partner Agent, who is a licensed real estate agent. The information regarding Westbrook Village has not been verified or approved by the developer or homeowners association. Please verify all information prior to purchasing. 55places.com is not responsible for any errors regarding the information displayed on this website.